Beatrice 'Bumble B.' Flinn has announced her Halloween costume, and it's perfect for her. She is going to be a Super Bee! But when her cape causes issues, B. feels less than super. She is on a mission to find her superpower, with or without her pesky cape! 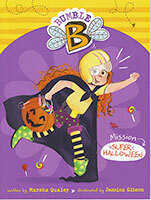 The Bumble B. early chapter book series will inspire young readers to never give up. Easy-to-read text, short chapters, fun illustrations, a glossary, discussion questions, and writing prompts complete the book.